Once fall hits, I always crave two things: roasted sweet potatoes and chili. 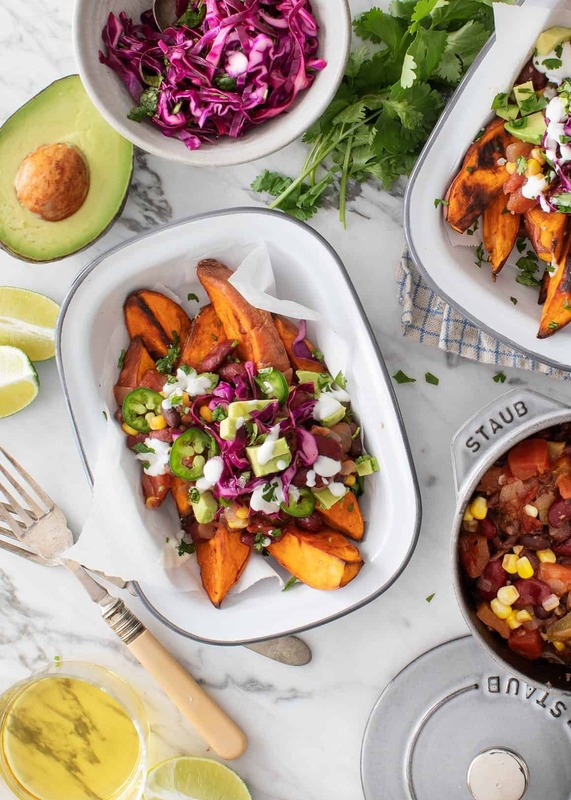 So naturally, I had sweet potato chili on my mind, but what I really wanted were big, puffy roasted sweet potato wedges and their deliciously sweet and browned caramelized edges. And that’s when it occurred to me – Sweet Potato Chili Fries! Well… wedges, technically. It’s the best of both worlds, and these little individual servings, topped with a quick slaw and avocado, are so fun to eat! I started with my favorite veggie chili recipe, which happens to be very quick and easy to make. Since there are multiple components to these fancy fries, I thought the chili part should be as no-fuss as possible. It’s made with green pepper, black beans, kidney beans, tomatoes, a good dose of chipotle chile peppers, and it’s finished with a bright pop of lime. This red cabbage slaw is as simple as can be with just a little olive oil, lime juice, cilantro, salt, and pepper. It adds a necessary crunchy brightness on top of the sweet potatoes and the chili. From there, you can top these with avocado, cilantro, and (in lieu of sour cream) a little Greek yogurt sauce, if you like. The bulk of these components – the chili and the slaw – can both be made in advance and kept in the fridge for a few days. 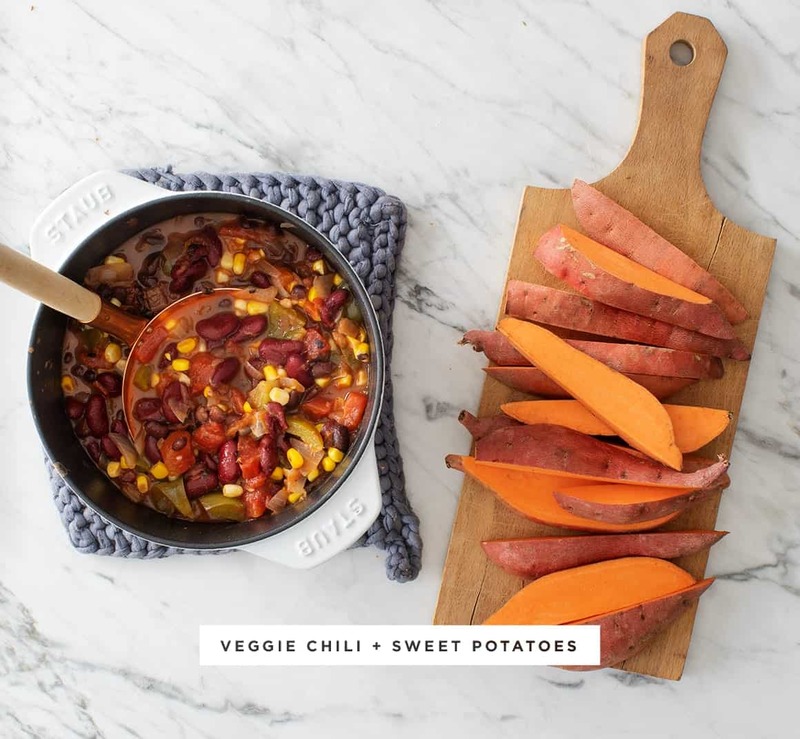 The chili also freezes well so you can keep it on hand whenever the sweet potato chili fries craving hits! Make the chili: Heat the oil in a large pot over medium heat. Add the onion, a few pinches of salt and pepper, and stir. Cook until the onion is slightly translucent, and then add the garlic and green pepper. Stir and cook until soft, 5 to 8 minutes, turning the heat down as needed. Add the tomatoes, black beans, kidney beans, chipotles, adobo sauce, corn, salt, and a few grinds of pepper. Cover, reduce the heat to low, and simmer for 25 minutes, stirring occasionally. If the chili becomes too thick, add water as needed. Stir in the lime juice and season to taste with more salt and pepper, as desired. Roast the sweet potatoes: Arrange the sweet potatoes on the baking sheet and toss with olive oil, salt and pepper. Roast 35 minutes or until browned around the edges. Make the slaw: In a medium bowl, combine the cabbage, cilantro, lime juice, olive oil, and pinches of salt and pepper. Season to taste and set aside. Make the yogurt sauce: In a small bowl, stir together the yogurt, olive oil, lime juice, and a pinch of salt. 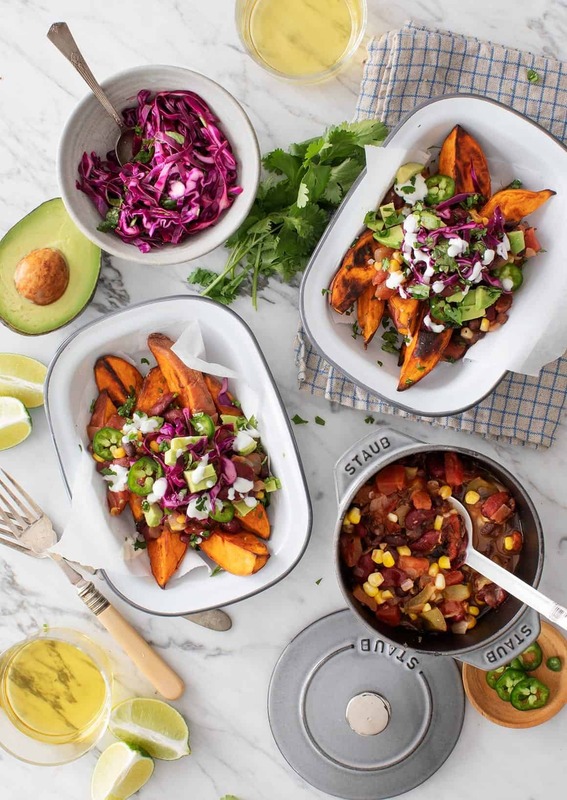 Assemble the chili fries with a layer of sweet potato wedges and a scoop of chili. Top with the slaw, avocado, and jalapeño and yogurt sauce, if using. Serve with lime wedges and garnish with cilantro.